The M2 Bradley infantry fighting vehicle named after the five-star general Bradley is one of the main equipment of U.S. Army mechanized infantry. It was designed to counter the threat posed by its Soviet counterparts. After the Revolutions of Central and Eastern Europe, there’s no more possible armour war in the Western Europe plain. Then U.S. Army used M2 Bradley IFVs in the two wars in the Persian Gulf region and obtained outstanding combat gains. With operational experience from the wars, the U.S. Army decided to upgrade its whole combat system so as to ensure the vehicle’s superiority on the battlefield. It was upgraded with better protection and fire control system and observation system. More importantly, the Force XXI Battle Command Brigade and Below (FBCB2) Battlefield Command Information System became a standard configuration of U.S. Army IFVs. This system provided enhanced interoperability and situation awareness of the battlefield. A totally digital M2A3 Bradley IFV was born. 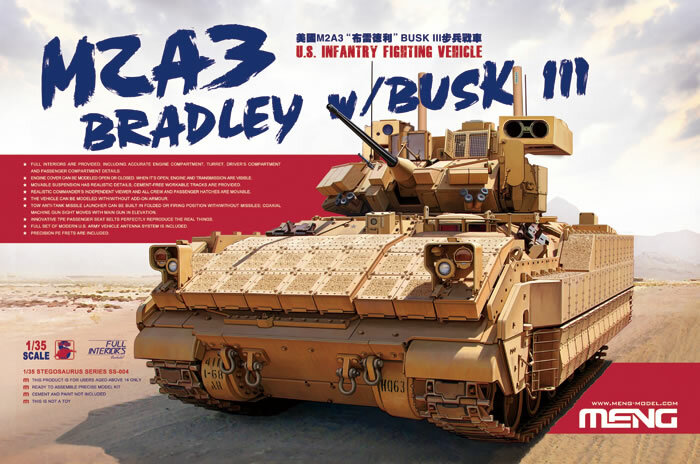 Now, the M2A3 Bradley IFVs are also installed with Bradley Urban Survivability Kits (BUSK) which provide further protection to the crew and the vehicles. After studying a lot of real vehicle reference material and carrying out complete and detailed design, we have now released this 1/35 scale SS-004 kit –U.S. Infantry Fighting Vehicle M2A3 Bradley w/BUSK III. In addition to features like accurate shape, rich details and perfect fit, this SS-004 kit also provides full hull and turret interiors (incl. engine, transmission and all parts in the driver’s compartment and passenger compartment). The real vehicle’s complete structure and details are precisely replicated with movable hatches, workable tracks, movable suspension and the linkage of the coaxial machine gun sight. The TOW anti-tank missile launcher can be modeled in folded or firing position with or without the missiles. The vehicle can be modeled with or without the ERA modules. What’s more, this kit also provides reasonably complete modern U.S. military antennae. With these options, modelers have more room to build their own M2A3 Bradley IFV models. This SS-004 kit consists of 667 parts on 23 plastic sprues (incl. 179 interior parts on 6 sprues), 31 parts on 3 PE frets, 10 parts on 2 TPE sprues (incl. Passengers’ safety belts and coaxial machine gun bullet belt), 168 track links of 2 cement-free workable tracks. This SS-004 kit will be the perfect choice for modelers who are machine fans and want to enjoy building a war machine, or who want to use models to tell a modern war story, or who are fans of U.S. weapons. Hope modelers will enjoy this kit. Highway guardrail and barricades are common civilian transport facilities in the Middle East. Their models can be used to make modern war dioramas more interesting and realistic. They can also be used as unique highlights in civilian dioramas of the same scale. 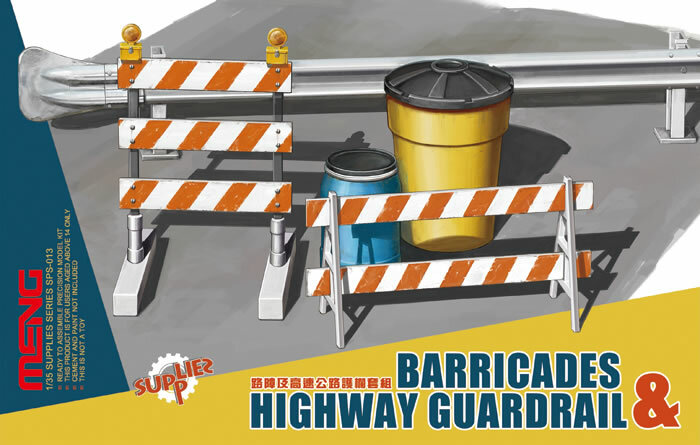 This 1/35 scale SPS-013 Barricades & Highway Guardrail set consists of 30 parts on sprues A and B, including two types of barricades (one of each) and two types of road safety barrels (one of each). More information about these releases will be available in the coming weeks.